Someone knows how to put it on ts or in another areas? No bro, to be there all the time and working. Or be specific where should I add it? Thanks. Simple copy/paste will not work cos it is not static image but dynamic php thing. To make it working you need to add some code to refresh that status, but no idea about details how to make. Hawks had such dynamic status on ts, so for sure it is possible. Thanks for reply Pyra. I just copy and paste this: https://forum.fonline2.com/status/status.php into Banner Gfx URL and doesnt work. I can just see 80 ppl online all the time. Do not work properly. What exacly should I add on that fields? I dont get it. That banner will refresh every 60s. This thing doesnt work again. Someone knows if have any change on it? How can I make it work? Its shows only offline status all the time. Idk why. PS: Its ok bro, the problem was that yesterday when I logoff server was off, and now when conect status was off (but server on). This thing just need little time to refresh info. 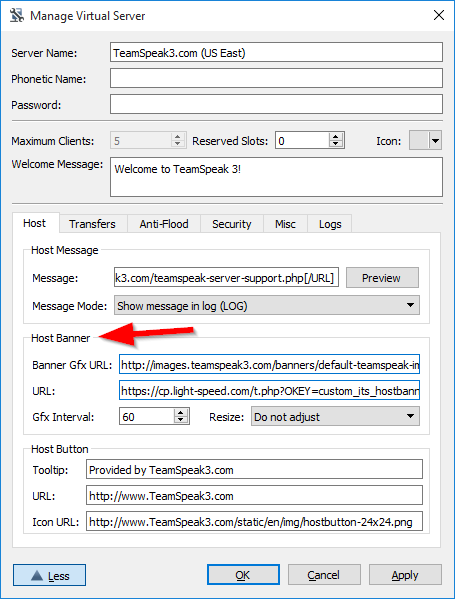 Someone knows how i can turn off server status from my team speak 3 client?